A year after Zika was declared a global health emergency, The Brazilian Ministry of Health is also contending with an outbreak of yellow fever in some of its rural areas. 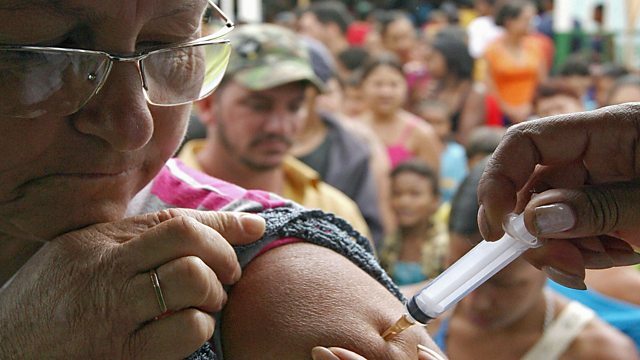 Brazil is on high alert and the government is upping its vaccination campaign to try and control the outbreak. Yellow fever is a disease that is far more deadly than Zika and there is concern about whether it might spread to cities. Joining Claudia, virologist Professor Jonathan Ball and Professor Carolina Pacca from Sao Paola discuss the situation. The Peruvian city of Lima is the world's second largest desert city after Cairo. Some of those living in the dusty arid shanty towns on the outskirts of Lima face all sorts of health issues, including TB, stomach infections and depression. Now landscape architects are working in collaboration with local residents to develop special ‘health’ gardens. Reporter Jane Chambers visited the district of Eliseo Collazos in Lima to visit the gardens. Many people get nervous before performing - whether that’s making a speech at a wedding or giving a presentation at work - and that anxiety can negatively affect their performance. New research by psychologists in the United States, has found that doing a quick ritual before performing can reduce anxiety and boost performance. Professor Michael Norton from Harvard Business School explains why they made people sing a very difficult song in public and what happened next.